That finding is surprising to scientists who study eelgrass, which sprouts in the brackish waters close to shore and provides shelter and breeding habitat for fish and invertebrates. 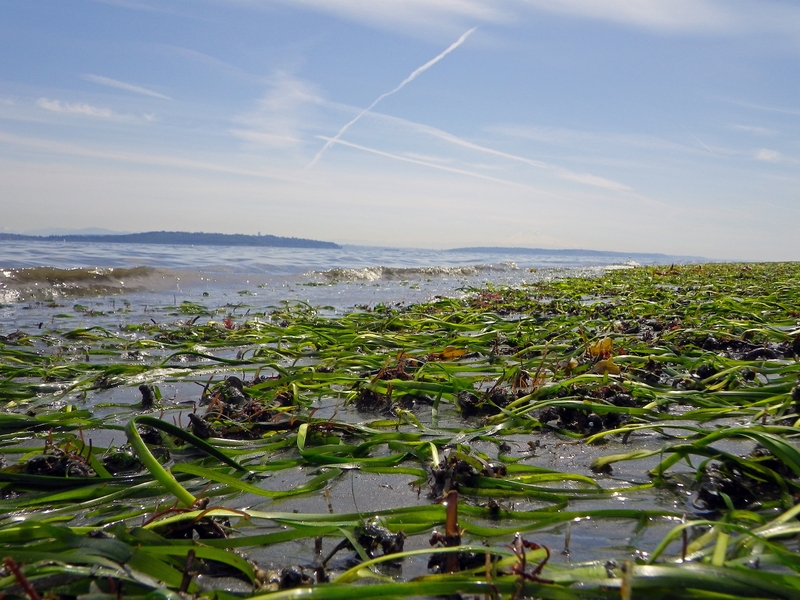 Along many beaches in Puget Sound, eelgrass has disappeared or drastically declined due to factors such as warmer, cloudy water, shoreline armoring and structures like piers and docks that block sunlight. The new findings, published online in November in the Journal of Ecology, draw on a unique 41-year dataset to show that across the Puget Sound basin, the eelgrass population is doing well. That means eelgrass die-offs at individual beaches are not pervasive enough to affect the overall population across the region. The study’s authors were able to analyze trends in eelgrass population over 41 years — the longest period ever recorded for this species in Puget Sound — by making use of shelved data that recorded more than 160,000 eelgrass observations dating back to the early 1970s. The data were collected for another purpose altogether: monitoring herring populations in Puget Sound. The Washington Department of Fish and Wildlife has surveyed Pacific herring spawning sites across the Sound since the 1970s, returning each year to rake the seafloor, then record all of the plant and animal species present. 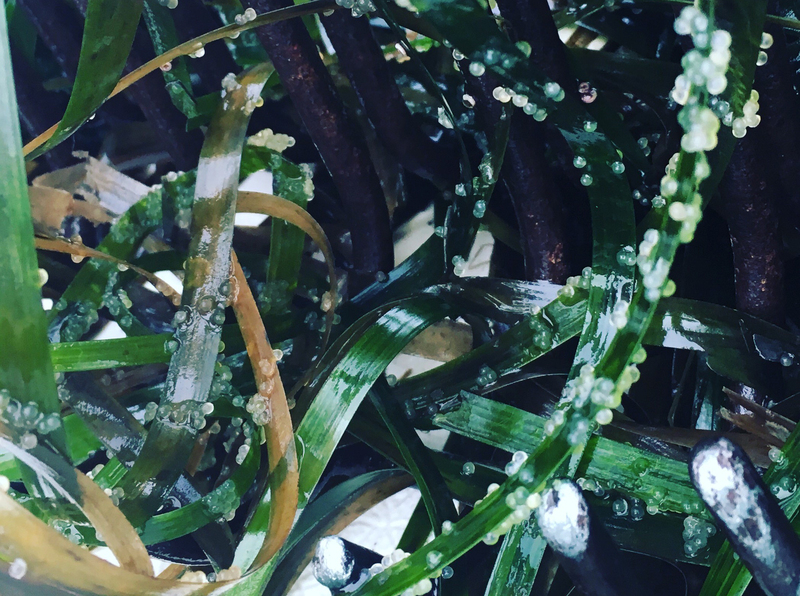 Since herring lay their eggs on eelgrass, these plants were also recorded in surveys along with the number of eggs and other species present. Student interns with the Puget Sound Institute at UW Tacoma manually digitized notebooks full of data, which then made the information accessible for complex modeling. The end result was a 41-year dataset of eelgrass observations covering more than 300 miles (500 km) of Puget Sound coastline. That’s about 15 percent of the region’s total shoreline. The analysis also confirmed what researchers, local residents and fishermen have observed for years — eelgrass declines happen in localized areas, and one beach might be depleted while another shoreline close by is teeming with healthy eelgrass. Herring populations also show localized trends. The most obvious impacts on eelgrass are human disturbances such as placing moorings in the water, running a motorboat in shallow water or pulling up eelgrass. But other causes of eelgrass decline in Puget Sound are unknown. Scientists suspect many factors are at play, and those mechanisms are further complicated as the climate and ocean continue to warm. “We are facing changing conditions, and eelgrass is found in a very sensitive fringe of Puget Sound that is going to change dramatically,” Francis said. This analysis could be useful to pair with local knowledge about what may have caused eelgrass to decline at a particular beach, the researchers said. Other co-authors are Blake Feist of the Northwest Fisheries Science Center; Gregory Williams of Pacific States Marine Fisheries Commission; and Adam Lindquist of the Washington Department of Fish and Wildlife. This research was funded by the Puget Sound Institute and the Washington Department of Fish and Wildlife. This article originally appeared in UW Today, a publication of the University of Washington Office of News and Information. Michelle Ma is assistant director of the university of Washington Office of News and Information.